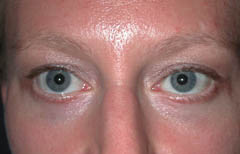 This 28 year old female was bothered by the prominent 'bags' under her lower eyelids, which had been present for a number of years. People would frequently ask her she was tired in the middle of the morning. 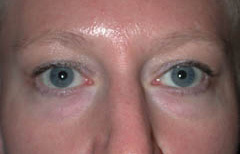 To address her concerns she underwent outpatient surgery on the lower eyelids, also known as blepharoplasty, to reposition the prominent fat pads into the depressed 'tear trough' area and tighten the skin and other tissues of the lower eyelids. 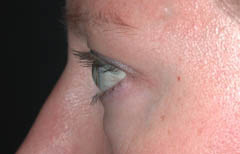 Her recovery was uneventful, and her photographs seven weeks after the procedure show a nice result with excellent shape and symmetry. 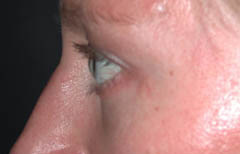 The scars are still pink, and they will continue to improve over the next few months.